6-string electric bass guitar from Vintage Modified series that delivers excellent low end – the welcome return of a long-vanished Fender classic in the deeply satisfying form. Although it is called a six-string bass it has the feel of a baritone guitar without the extended neck. The strings are not extra thick so it is a great transition from guitar. The original model of 1961-1975 has provided distinctively voiced low end for everyone from the Beatles to the Black Keys, Cream to the Cure, and many others. The instrument delivers authentically vintage-style look and tone, with a few modern touches such as a comfortable ''modern C'' neck profile and 241mm fingerboard radius, and three custom Jaguar single-coil pickups with notched ''claw'' shielding rings (reverse-wound/reverse-polarity middle pickup). Other features include the model's classic 762mm scale (standard tuning one octave lower than a guitar), basswood body and maple neck fitted with bound rosewood fingerboard with 21 medium jumbo frets and pearloid block inlays, four two-position slider switches (on/off switch for each pickup and one bass-cut ''strangle'' tone circuit switch), tortoiseshell pickguard, two black plastic control knobs (master volume, master tone), and vintage-style six-saddle bridge with non-locking floating vibrato. Olympic White colour design. 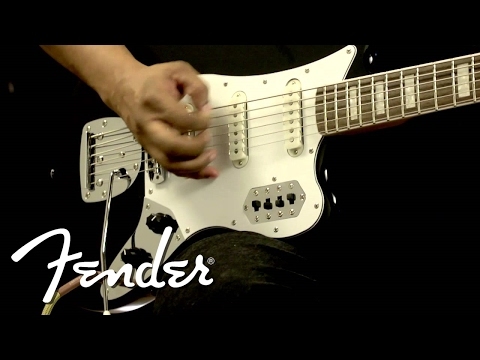 Do you own Fender Squier Vintage Modified Bass VI 6 String Olympic White or have you had a chance to try it? Eigentlich ein gutes Instrument - wenn man: die Saitenlage neu justiert hat, den Hals eingestellt hat, die fehlenden Ösen in der Steghalterung eingesetzt hat und event. noch die hinteren Bünde etwas angeglichen hat und am besten den Sattel austauscht, damit die hohe E- Saite etwas mehr Richtung Griffbrett geht, ja dann hat man wirklich ein gutes Instrument. Der normale VK-Preis ist für diese Qualität nicht angemessen - aber bei Muziker gab es ihn zum Schnäppchenpreis, von daher ok!